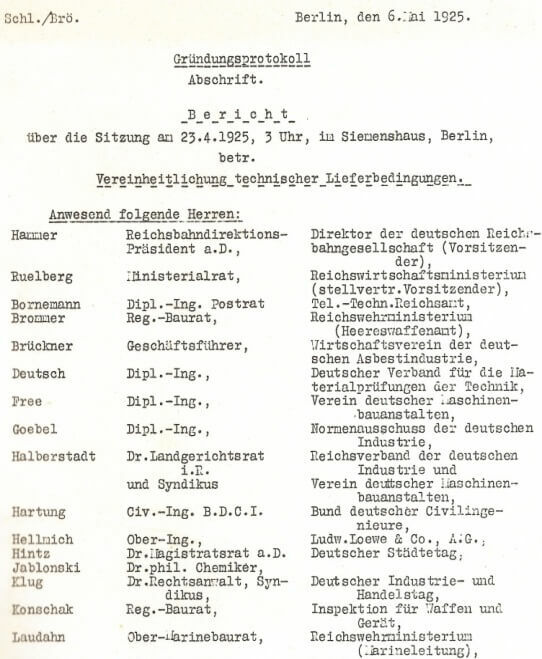 In collaboration with representatives from the German economy, testing institutions, consumer organisations and the responsible state ministries, the cornerstones of the quality assurance system were formulated and published for the first time in August 1954 under the title of “RAL-Grundsätze für Gütezeichen” (RAL Fundamental Guidelines for Quality Marks). Twenty years after the re-launch of RAL, its status as a registered association with its own legal identity was restored. The Executive Board of RAL has since been made up of representatives from leading economic organisations, consumers, federal and state authorities and four full members from RAL who are elected at the AGM. The board of RAL – previously the Advisory Board, today known as the Board of Trustees – reflected the balance of the business partners concerned and demonstrated the strict neutrality of RAL. As a result of its recognised expertise in the issuing of quality marks, the Federal Environment Agency assigned RAL the new responsibility of awarding the Blue Angel in December 1978. Therefore, RAL assumed a pioneering role as an environmental service provider from the very beginning. RAL receives a new name: RAL Deutsches Institut für Gütesicherung und Kennzeichnung e. V. This non-profit organisation placed their focus even more strongly on the organisation and functions of the quality assurance system and its labelling expertise. In order to underline the significance of the RAL quality assurance system, the “Fundamental Guidelines for Quality Marks” were published following a number of amendments on 9 August 1985 in the German Federal Gazette by the Federal Ministry of Economics. The European Commission created the joint EU environmental label the “EU Flower” – today called the EU Ecolabel – in 1992. As a result of its long-standing experience in environmental labelling, RAL was viewed as a suitable partner to take on the role of awarding authority by the Federal Ministry for the Environment, Nature Conservation and Nuclear Safety and the Federal Environment Agency. In November 1992, RAL was issued with the task of awarding the European environmental label in Germany and was named a “Competent Body” by the European Commission. RAL Colours & Ecolabels given a new legal form: The RAL Deutsches Institut für Gütesicherung und Kennzeichnung e. V. formed a new company called RAL gGmbH to handle its RAL Colours and Ecolabels business areas. The company is a 100% subsidiary of the RAL Deutsches Institut für Gütesicherung und Kennzeichnung e. V. and was entered in the commercial register on 29. August 2008. Quality and consumer protection has been the job of RAL for many decades. Against this background, companies can have their brands independently marketed in the RAL LOGO LICENCE business area. RAL has been commissioned to carry out this task by Stiftung Warentest since 2013. Companies who want to advertise their tested products or services using the test logo from Stiftung Warentest can acquire a corresponding licence from RAL. Thanks to continuous monitoring of the market, RAL also ensures that the label is not being misused. We pass on our specialist knowledge to interested parties and a variety of occupational groups at our seminars, workshops, presentations and talks. The provision of high quality further training to colour designers is a key focus of the RAL ACADEMY.